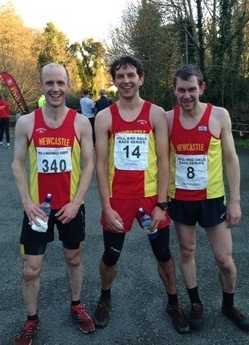 On Thursday 25th April 2013, Newcastle AC welcomed another large crowd to their increasingly popular Hill & Dale Series. Kilbroney Park, Rostrevor was the venue of choice for the third race in the series, where competitors took on the tough Slieve Martin course, measuring 4.25 miles and including a steep 1,740ft climb. In perfect conditions and a stunning setting, Ian Bailey (Newcastle AC) proved a dominant figure, leading the field onto the long continuous climb out of Kilbroney Park. Ian’s relentless climbing saw him fend off any challengers and he reached the top alone. He descended just as forcefully, pushing the pace the whole way to the finish, crossing the line in 34:08 to win clearly. David McNeilly (Newcastle AC) was the next participant into view, looking strong; David completed the course in 36:03 to take 2nd place. David Steele (36:42) made it an impressive 1-2-3 for Newcastle AC, claiming the final podium place. The ladies race was as close as expected, with another exciting dual between Shileen O’Kane (Lagan Valley AC) and Diane Wilson (Dromore AC), following on from their good battles at Slieve Gullion and Silent Valley. On this occasion, Shileen came out best, completing a hat-trick of Hill & Dale 2013 race victories in 41:41. Diane took 2nd place in 42:04, while Springwell Running Club’s Gillian Wasson (42:44) ran well to secure 3rd place.